All Be Cool radiators are compatible with all coolants and 100% Made In The USA! They are Guaranteed to lower your coolant temperature a minimum of 20-degrees, or your money back! In fact most customers report even greater coolant temperature drops. If you have a stock vehicle think O.E.M., but if you have a performance vehicle you should consider Be Cool! Be Cool's Radiator Modules take the guesswork out of properly cooling your vehicle because every component in a Module Assembly has been carefully matched for peak efficiency. These modules include an aluminum radiator, single or dual electric fan(s), aluminum fan mounting brackets, an electric fan wiring harness w/temperature sending unit and 40 AMP waterproof relay, diamond-cut aluminum vented recovery tank, and a round billet Be Cool signature radiator cap. 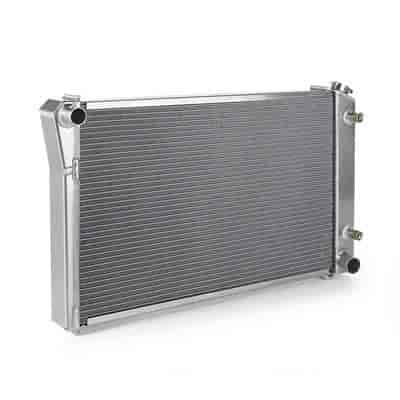 Does Be Cool Radiators 66062 fit your vehicle?